At the end of May the Alpine Convention Day was held in Mojstrana. The aim of the event is to raise awareness regarding the sensitivity of the Alps and the challenges in the Alpine space as well as to shed light on the relevance of the Alpine Convention, the specific characteristics of the Alpine valleys and the relevance of nature and cultural heritage conservation. 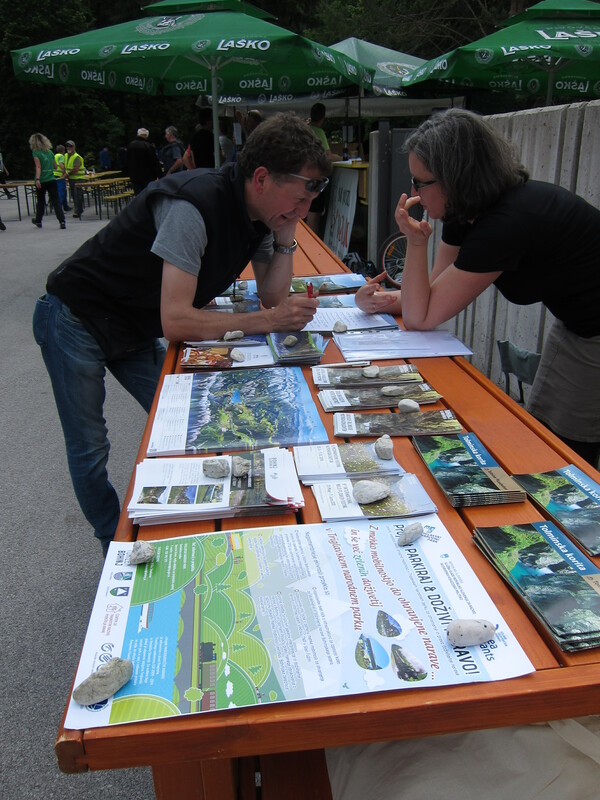 The event also focused on encouraging visitors to visit the Alpine valleys in an environment-friendly manner. In the framework of the event, specifically on 30 May 2015, the partners presented the project “Park and experience nature”. They prepared a new poster and distributed a leaflet on environment- friendly mobility in Bohinj and on project objectives (in the framework of the presentation of Bohinj Tourism) and thus informed the participants on project-related activities and new forms of mobility which are being realised in the framework of the project. They drafted a questionnaire on sustainable mobility to gather information on the current mobility-related habits, and got a response to various programmes and forms of mobility which are or will be available in Bohinj. A roundtable titled “Introducing sustainable mobility concept in Bohinj” was held in Bohinjska Bistrica in the beginning of June. Project partners presented the project and project-related activities to be implemented in the area of Bohinj, in particular in the field of infrastructure and actions to reduce visit by motorised vehicles. The round table was attended by the representatives of the tourist economy in Bohinj as they are the ones with the richest experiences and the most frequent contacts with the visitors. A proposal was made to lower the price of parking next to the lake Bohinjsko jezero during the pre- and post-season period (e.g. amounting to 0.4 EUR/hour instead of the current 1.5 EUR/hour), and to raise the price of parking during the high season. This would motivate the visitors to visit Bohinj also in spring and fall as well as to park their motorised vehicles in the areas away from the lake where parking is free. With the new leaflet prepared in the framework of the project the visitors are informed about the free parking as well as about the public transportation schedule and the activities to be implemented in the framework of the project.